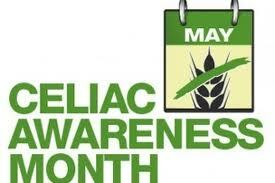 If you're already a Rudi's Gluten Free Bakery fan, you probably are well aware of the fact that they have been running their 2nd annual Spread the Bread campaign throughout all of May! As an allergy mom and a huge fan of Rudi's Gluten Free and Organic Bakeries, I am pleased to be able to offer a Giveaway on their behalf in support of this great cause. Just this past week, I was lucky enough to receive some samples of Rudi's' Gluten-Free Plain, Fiesta and Spinach Tortillas, Tortilla Fact Sheet. They are also dairy-free and nut-free, extra bonuses in this household. They don't mention being egg-free, but I see NO traces of this tricky allergen in their ingredient list. 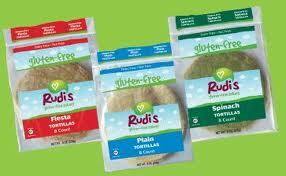 Post a recipe letting me (on either my blog or FB page) and Rudi's know how you are planning on using these wraps. Enchiladas? Tortillas? Sandwich wraps? As always, the winner will be chosen via Random.org. Contest ends Thursday night at 11:59pm MST! Get your ideas in fast!! With your permission, of course, I would like to repost what I find is one of the most interesting meal ideas as a one of my next blogs! I can't wait to gain some new recipe ideas! Be creative and have fun!